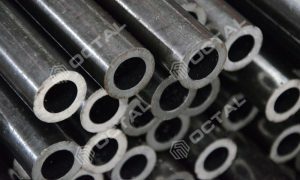 Octal supply ASTM A213 tubing (seamless) in common grades T9, T11, T22, T91, T92 of alloy material, grades TP304L and TP316L of stainless steel. 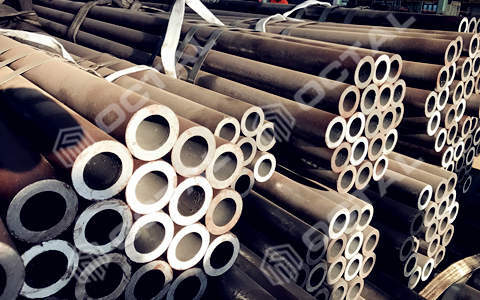 ASTM A213 (ASME SA213) tubing has been widely used in high temperature services especially for the boiler and superheater. 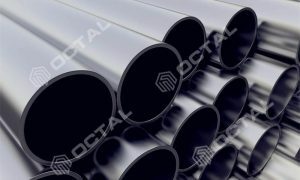 Tube material could be in alloy steel and stainless steel, and manufactured in seamless of hot rolled or cold drawn. so this pipe usually used in very important places and the price is much higher than normal carbon pipes. Common grades are T9, T11, T12, T21, T22, T91 and stainless grades in TP304 or TP316. As ASTM Defines: “This specification covers seamless ferritic and austenitic steel boiler, superheater, and heat-exchanger tubes, designated grades T5, TP304, etc. Which is listed in tables 1 and 2. View here for ASTM A213 standard specification. The size range for this tube is from internal diameter 1/8 inch and up to 5 inch OD. Thickness from 0.015 to 0.500 inch (0.4 mm to 12.7 mm). 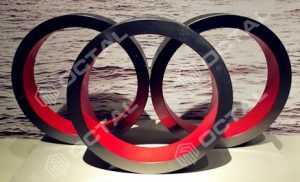 Also if for other size required, it could be specified in the order, also should be stated with minimum and average thickness. A5.28 Refer to gas shielded arc welding. A5.29 Refer to flux cored arc welding. For ASTM A213 low alloy steel tube including the grades ASTM A213/ASME SA213 T2, T5, T5b, T5c, T9, T11, T12, T17, T21, T22, T23, T24, T36, and ASTM A213 T91, ASTM A213 T92, T122, T911, and covers the Austenitic and Ferritic stainless steel, in ASTM A213 TP201, TP202, XM-19, TP304, TP304L, TP304H, TP304N, TP304LN, TP309S, TP309H, TP309LMoN, TP309Cb, TP309Hcb, TP310S, TP310H, and TP316, TP316L, TP316H, TP316Ti, TP316N, TP316LN, TP317, TP317L, TP321, TP321H, and etc. For more grades please review the standard of ASTM A213. These are applied at the high temperature environment, for example to used at over heat exchanger and re-heat exchanger. For A213 Grades that contained letter H, is not the same than the material in same grade without H. With H it means higher creep-rupture strength. 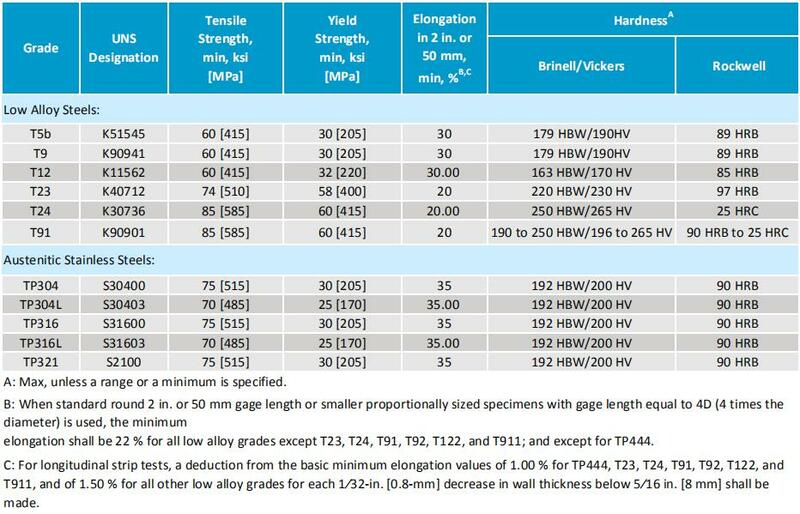 View below of ASTM A213 tubing chemical composition in table 2, mechanical properties in table 4.
b. 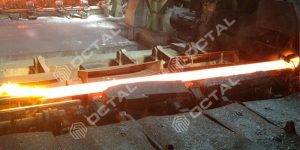 For grades T91, T92, shall be normalize and temper, where normalizing shall be above 1040℃, tempering shall be above 730℃. As the delivery conditions. 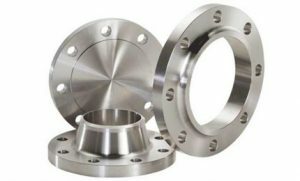 Permissible variations from the specified minimum wall thickness shall be in accordance with Specification A1016/A1016M. The resource belongs to the product Stainless Steel Pipe and Tube Click permalink to view detail & more descripton.